Pardon our dust while we update this corner of the website. Enter a comma-separated list of keywords or phrases that best describe this object to make it more accessible during searches. Please check your spelling. Huge expansive landscapes are a central motif in the art of Anselm Kiefer, born in Germany in 1945, the year World War II ended. 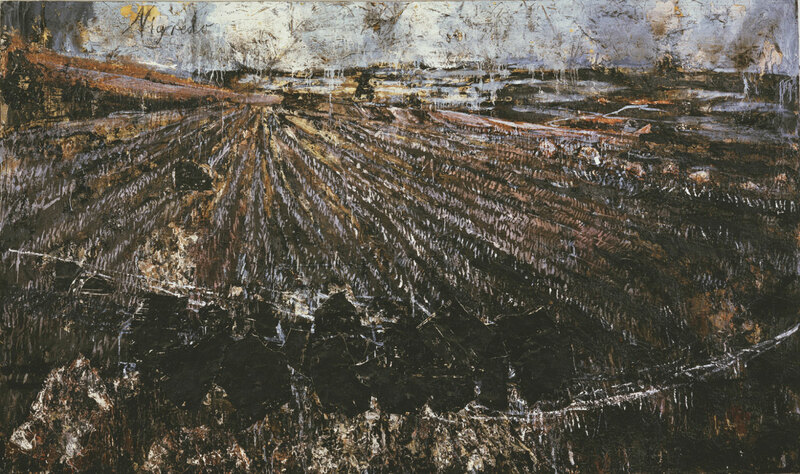 Kiefer's landscapes bear witness to centuries of conflict and devastation on German soil. The word nigredo, written in the upper-left corner, refers to alchemy, the medieval "science" that sought to transform earth into gold through a process of burning. Nigredo, the first stage of transformation, is characterized by blackening, followed by the emergence of a glowing light. Anselm Kiefer's work has been interpreted as an exploration into the German nation and culture: a resurrection of symbols and memories taboo since the reign of the Nazis, and thus an evocation of a collective trauma that modern times have suppressed. This virtuosic landscape, a possible metaphor for the country as a whole, is bult of thick layers of oil, acrylic, emulsion, shellac, and straw painted over a full-size photograph. The rocky field is ravaged, its heroic scale defeated and its symphonic music silenced. The title of the painting, however, provides an element of hope. "Nigredo" is a stage in the alchemical process of transformation of ordinary matter into gold; it is the moment of chaotic destruction that precedes purification. Despite the painting's primarily dark palette, its surface radiates a shimmering light that bears the promise of the transformation underway. Ann Temkin, from Philadelphia Museum of Art: Handbook of the Collections (1995), p. 342. Kiefer began Nigredo by covering nearly the entire surface of a colossal canvas with a full-size photograph of a landscape. This photographic base was then hidden by successive applications of thick layers of viscous pigment, acrylic, emulsion, shellac, and straw, producing a dense impasto with a charred surface matching that of the apocalyptic wasteland depicted in the painting. According to the artist, the landscape was inspired by the sight of a field of peat moss in Ireland, but there can be no mistaking the underlying reference to World War II, the devastation of Europe, and the destruction of German civilization under the Nazi regime. The somber field of burnt stubble can be read as an allegory of loss expressing a collective yearning for pre-Nazi history, memories, and countryside before Germany was bombed, burned, and ravaged. The artist represents the recent past as a furrowed field rendered vast by the high horizon. Black boulders, made using the traditional German medium of the woodcut, occupy the foreground. Kiefer draws the viewer into this deep, receding space with a series of perspective lines leading to a single point on the horizon. The scrawled inscription "Nigredo" in the upper left-hand corner of the painting refers to alchemy, the medieval science that sought to transmute earth into gold through a process of burning. Nigredo represents the first stage of alchemical transformation, characterized by a black liquid, which is followed by the emergence of a glowing light. The alchemists believed that the creation of gold out of base matter was symbolic of a far larger achievement, that of universal redemption. The faint gold behind the word Nigredo may refer to the possibilities of spiritual and cultural renewal in Germany after the cataclysmic horrors of the twentieth century. Twentieth Century Painting and Sculpture in the Philadelphia Museum of Art (2000), p. 140.